A cleanroom is an environment that is designed, built and operated to provide cleanliness, control and/or isolation for certain processes. 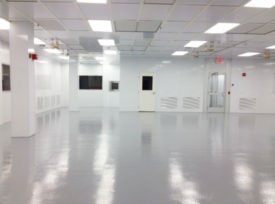 Cleanroom technology is commonly used in manufacturing and research and development in fields such as Nanotechnology, Defense, Microelectronics, Pharmaceuticals, Biotechnology, Medical Device Industries, as well as many others. Many industries have recently discovered the benefit and need for cleanroom technology for their specific processes. The purpose of a cleanroom is to protect the product or the process from contamination, to restrict access to the product or process and to contain any hazards located in the cleanroom. Cleanroom technology standards ensure that cleanrooms have little to no contamination, which is anything that could corrupt the process or make the product impure. Contamination, by cleanroom standards, is defined by a specified number of certain size particles per cubic foot of air. The particle size measured in cleanrooms are typically 0.5 microns (µm) or larger in diameter. For perspective, a human hair is 60 -80 microns wide and outside air has about 35,000,000 0.5µm and larger sized particles sized per cubic foot of air.